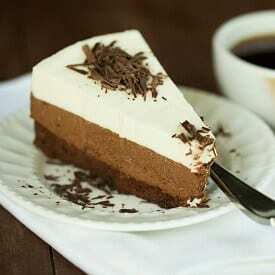 I have been tempted by Triple Chocolate Mousse Cake for well over three years now. I’ve seen a variety of recipes in a number of different places and have bookmarked it and doggy-eared it countless times. One day last week, my Chief Culinary Consultant mentioned that it had been awhile since I had made a big ol’ fancy cake. A show-stopper, as it were. Challenge accepted. I sifted through my notes, spreadsheets and cookbooks to see what I might want to bake up, when a page from a long-gone Cook’s Illustrated magazine fell out of a binder. 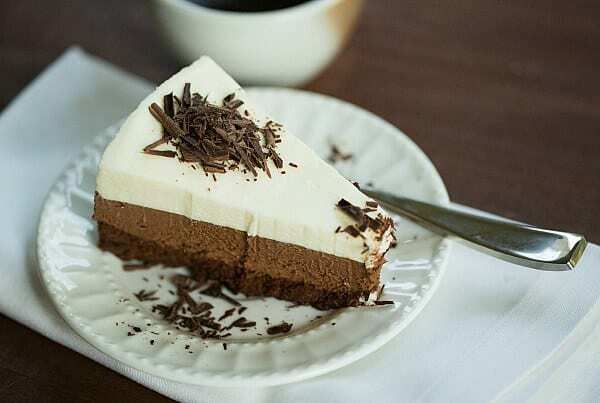 The Triple Chocolate Mousse Cake. It was destiny. This triple layer cake is the trifecta of chocolate deliciousness. 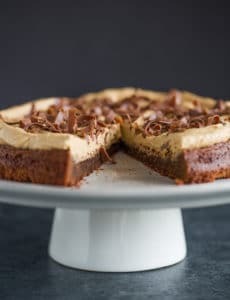 The bottom layer is a flourless chocolate cake… the middle layer is a light dark chocolate mousse… and the top layer is an even lighter white chocolate mousse. The combination of the three is rich, intensely flavorful and silky smooth. 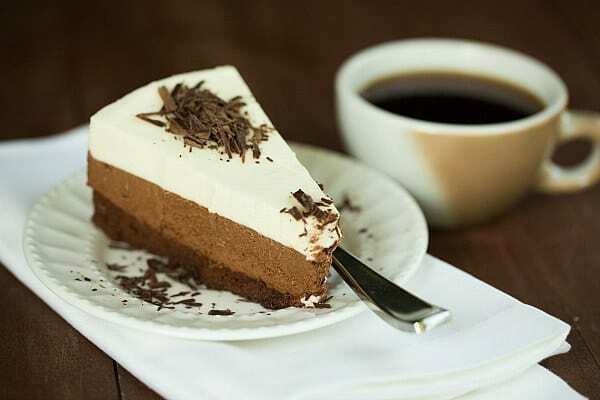 It’s a fabulous dessert to pair with coffee and enjoy slowly, lingering over each bite. This cake is the holy grail for any chocolate lover. It takes a bit of time, but the assembly is relatively easy and absolutely, 100% worth it. You owe yourself this treat! 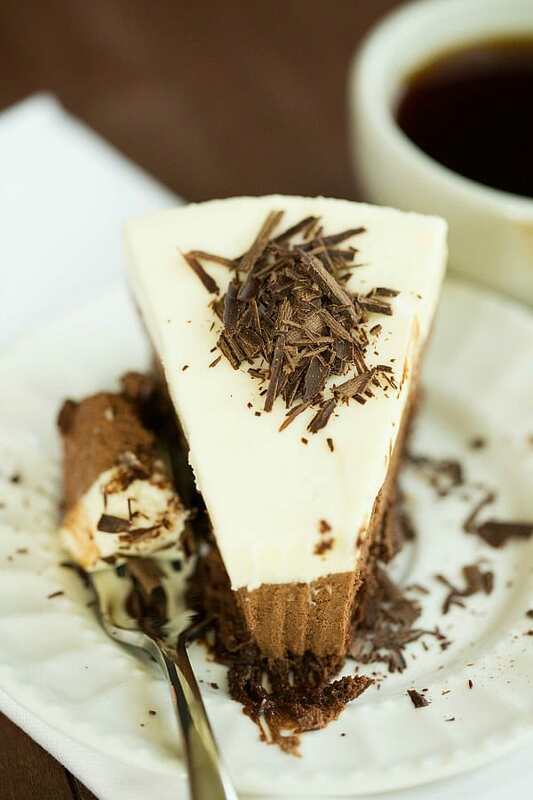 Layers of flourless chocolate cake, dark chocolate mousse and white chocolate mousse create an absolutely sinful dessert for chocolate lovers everywhere. Make the Bottom Layer: Preheat oven to 325 degrees F. Butter the bottom and sides of a 9-inch springform pan that is at least 3 inches high. Melt the butter, chocolate and espresso powder in a large heatproof bowl set over a saucepan filled with 1 inch of barely simmering water, stirring occasionally until smooth. Remove from heat and cool for 5 minutes. Whisk in the vanilla and egg yolks; set aside. In a stand mixer fitted with the whisk attachment, beat the egg whites and salt at medium speed until frothy, about 30 seconds. Add half of the brown sugar and beat until combined, about 15 seconds. Add the remaining brown sugar and beat at high speed until soft peaks form when the whisk is lifted, about 1 minute longer, scraping down the sides halfway through. Whisk one-third of the beaten egg whites into the chocolate mixture. Using a rubber spatula, fold in the remaining egg whites until no white streaks remain. Carefully transfer the batter to the prepared springform pan, gently smoothing the top with an offset spatula. Bake until the cake has risen, is firm around the edges, and the center has just set but is still soft (the center of cake will spring back after pressing gently with your finger), 13 to 18 minutes. Transfer the pan to a wire rack to cool completely, about 1 hour. (The cake will collapse as it cools.) Do not remove the cake from the pan. Make the Middle Layer: Whisk together the cocoa powder and hot water in a small bowl and set aside. Melt the chocolate in a large heatproof bowl set over a saucepan filled with 1 inch of barely simmering water, stirring occasionally until smooth. Remove from heat and cool for 5 minutes. In the bowl of a stand mixer fitted with the whisk attachment, whip the cream, granulated sugar and salt on medium speed until the mixture begins to thicken, about 30 seconds. Increase the speed to high and whip until soft peaks form when the whisk is lifted, 15 to 60 seconds. Whisk the cocoa powder mixture into the melted chocolate until smooth. Whisk one-third of the whipped cream into the chocolate mixture to lighten. Using a rubber spatula, fold in the remaining whipped cream until no white streaks remain. Spoon the mousse into the springform pan over the cooled cake and gently tap the pan on counter 3 times to remove any large air bubbles; smooth the top with an offset spatula. Refrigerate for at least 15 minutes while preparing the top layer. Make the Top Layer: In a small bowl, sprinkle the gelatin over the water; let stand for at least 5 minutes. Place the white chocolate in a medium bowl. Bring ½ cup of the heavy cream to a simmer in a small saucepan over medium-high heat. Remove from heat and add the gelatin mixture, whisking until fully dissolved. Pour the cream mixture over the white chocolate chips and whisk until the chocolate is melted and the mixture is completely smooth. Cool to room temperature, stirring occasionally, 5 to 8 minutes (the mixture will thicken slightly). In the bowl of a stand mixer fitted with the whisk attachment, whip the remaining 1 cup heavy cream at medium speed until it begins to thicken, about 30 seconds. Increase the speed to high and whip until soft peaks form when the whisk is lifted, 15 to 60 seconds. Whisk one-third of the whipped cream into the white chocolate mixture to lighten. Using a rubber spatula, fold the remaining whipped cream into the white chocolate mixture until no white streaks remain. Spoon the white chocolate mousse into the pan over the middle layer. Smooth the top with an offset spatula. Return the cake to the refrigerator and chill until set, at least 2½ hours. Could I replace a little of the cream with half and half? I don’t quite have enough cream to make this recipe and am loathe to buy another carton :). Thanks!! Hi Meg, If it’s only a small amount, it should be okay. Thank you for small tips along the recipe. They are really helpful to beginners like me. I just made this for mother’s day and it got rave reviews from my family. My only issue was the bottom layer which shrunk away from the sides of the pan so I didn’t get the exact picture perfect finish I was hoping for. I was hoping for cleaner sides when I unsprung this from the pan. That being said, it was incredibly delicious and I topped it with some chocolate decorations and chocolate covered strawberries which more than made up for the sloppy sides. And best of all, my mom was happy. I”be made this cake 3 times before, however made the mousses with a custard base. Loved it. 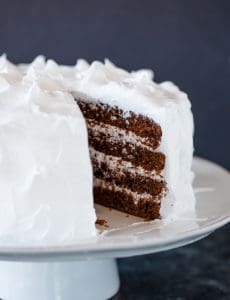 Can I make ahead and freeze, or even make cake layer ahead and freeze it? Hi Wanda, So glad you’ve enjoyed this cake! Yes, you can freeze either the cake layer or whole cake. Enjoy! Hello Michelle! Going to make this for a party tomorrow night. I am wondering about the white chocolate layer. Could i use the Bakers white chocolate bar instead of white choc chips? Or a combination of the two? Hi Juli, I haven’t tried using a baking bar, but I don’t see an issue. In step 8 you say to bring the 1/2 cup of heavy cream to a simmer, does it need to reduce at all, or just reach the simmer and immediately be removed? It does not need to reduce, just bring it to a simmer then immediately remove. Wow! This recipe was very well written and the details and specificity made it easy to follow even though it is a slightly challenging recipe. I made this for a work bake off competition and many people were extremely impressed. The softness of the mousse is delicate and delicious the three layers make it unique and beautiful.The only challenge I had was that after I cooked the bottom flourless chocolate layer, it shrunk a little in the springform pan and so I was concerned about laying the second layer and having it squeeze through the cracks. It seemed to work just fine, but I was nervous when I saw the gaps between the pan and the cake. I will let you know if I win the contest! 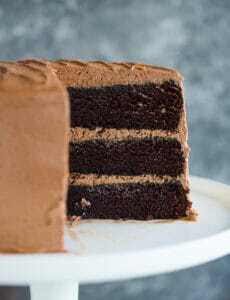 I need to make 200 mini triple chocolate cakes for a petite dessert competition & I’m trying to figure out how I could cut this cake into small circles. I’ve tried freezing it but it seems the moisture from freezing causes the mousse to fall. Any ideas on what would be the best way to make this dessert petite? Oh my, that’s a tough one! what about scaling up the recipe but making it on a sheet pan so that the layers are really thin? I don’t know if that would fit the bill, but it’s the only thing I could think of! Hi Cindy, I have never tried freezing this, so I couldn’t say for sure. If you do, I would defrost it in the refrigerator overnight. The cake can be made up to 1 day in advance. Such a beautiful dessert! Can this be made 3 days in advance and placed in the fridge ? Hi Daphne, Thank you! Yes, this can be prepared ahead of time and refrigerated.